Bengaluru, in the heart of south India—known to the outside world as India’s IT hub, or outsourcing pit, depending on whom you talk to—is also one of the country’s greenest cities. Hence, it has other erstwhile names of Garden City and Pensioners’ Paradise. Sure, residents lament at the browning of what used to be their green haven, but the truth is that Bangalore (as it is still popularly called) has some of the oldest and best gardens in India, including the Lal Bagh Botanical Garden dating back to 1760 (originally called the Cypress Gardens) and Cubbon Park established in 1870. Apart from the parks and gardens everywhere, more than one city neighbourhood (including the densely populated southern suburb, where I live) has what is called a mini-forest, with close to 500-1,000 trees and plants within a small area. The campus of the Indian Institute of Science (IISc) is a good example of such a cultivated urban forest, stretching over 1.5 hectares (3.7 acres). These mini forests are not just home to several varieties of plants and trees, birds and insects, but also act as carbon sinks that help reduce the air temperature by a degree. In general, the forest and tree cover in the country has been showing a healthy growth over the last few decades. According to the 2015 report by the Food and Agriculture Organisation of the United Nations (FAO), India ranks 10th in the list of countries with the highest forest cover (close to 24%). It also finds a place in the top 10 in the list of countries that have reported the highest net gain in forest area between 2010 and 2015. According to the 2015 Indian State of Forest Report (ISFR) released by Forest Survey of India (FSI), India’s total forest cover has increased by 5,081 sq.km in the past two years (since the previous report). That said, the situation is fairly abysmal in urban India, with tree cover in the capital city of New Delhi standing at a mere 7.49% (180 sq.km of forest cover)—compare that with over 21% in both New York City and London. However, Delhi’s record is still much better than other Indian megacities, with Bengaluru trailing at second place with 97 sq. km (according to a 2015 report by the ministry of environment and forests). What is true, however, is that among Indian cities, Bengaluru has one of the richest histories of tree cultivation, with the city’s tree cover now denser and more varied than a couple of centuries ago, when the idea of keeping Bengaluru always in bloom started. 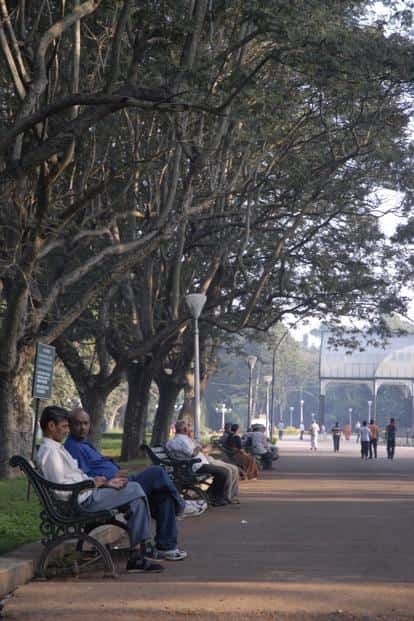 Vijay Thiruvady, a trustee of the Bangalore Environment Trust, who regularly conducts the Green Heritage Walk at Lal Bagh, says: “The spirit of arboriculture—study and appreciation of trees—in Bangalore has always been greater than in any other Indian city. But many people are still not aware of the history of trees in Bangalore. For instance, that most of the trees now seen everywhere in the city are not native to Bangalore and were introduced in the past 200 years." In a first in India, Bengaluru has also begun to show its love for trees through a festival organized and managed entirely by volunteers, and free to everyone. In its third edition in 2017, the Neralu Tree Festival—neralu meaning shade in the local Kannada language—encourages people to stop and look at trees. This invitation is for everyone—and not just practised tree huggers—to admire trees, for not just their environmental benefits but also for their aesthetic and artistic appeal. Raji Sunderkrishnan, a key volunteer for this year’s festival, says: “Everyone knows about the scientific reasons to have trees around—weather, water levels and so on. But trees give so much joy in the form of shade, fruits, flowers and a habitat for birds. We want to get people to pause and look at the trees, to bring greenery to their active consciousness." The idea of Neralu was born in 2014, over casual conversation with friends who shared a love for Bengaluru and for nature. The original founders do not wish to be identified by name and hand over the planning to a different team each year, only stepping in as volunteers closer to the actual dates. What makes this festival unique—apart from the fact it is an unabashed celebration of trees—is that it is managed entirely by volunteers and entirely free. A festival for the people and by the people, as the team likes to believe. As Thiruvady says, “This kind of a festival means free and voluntary participation in an activity created by citizens for citizens—and it is great since it means more and more people get involved in the subject of trees one way or another." Every year, close to 100 volunteers from all walks of life lend their time and expertise to various aspects of the festival: logistics planning, photography, painting of posters, advertising, media liaison, connecting with artists and so on. Months prior to the actual festival, open meetings are held on Sunday afternoons at the Cubbon Park bandstand. “The idea is to give a sense of ownership to the people who manage it," says Sunderkrishnan. Funds for the festival are raised entirely through public donations, and details about the funds collected and the sources are laid out bare on their Facebook page and their website. This model of sponsorship is based on a conscious decision taken right at the beginning to avoid any government or corporate sponsorships. The Neralu team is a group of individual citizens, and is not associated with any organisation or the government. "The idea is to convince citizens that with a little effort, nature and development can co-exist peacefully" which is Neralu's intent, and would be the correct statement to convey the thoughts of the team about what 'method' to adopt, to build awareness", says Sunderkrishnan. This year, the festival is scheduled for 18-19 February, and will include more than a dozen tree walks by experts all over the city, along with talks and panel discussions, storytelling sessions, art installations, music concerts and project presentations by school students. The tree walks—over 10 on a single morning—will take place not only in the larger public gardens but also in the smaller avenues scattered across the city—where a different flower blooms every month—to show that “in Bangalore, you don’t need to go to a park to see different kinds of trees". The formal events are to be held at NGMA (National Gallery of Modern Art), which has been providing support and space to Neralu since the inception of the festival. In the spirit of keeping the festival fun and engaging at the same time, the Neralu team has been trying to change the activities every year. Events are spread out over the weekend, with Saturday devoted to tree walks conducted by naturalists and scientists (they had a fig tree expert a couple of years ago), accompanied by talks about the history of tree cultivation in the city, and detailed thought that has gone behind the planting process. Apart from programmes in multiple languages, there is a focus on engaging with schoolchildren. The Neralu team sent out activity kits a few weeks ago to get children (not just from elite, English schools) involved—by way of sketching out leaves, identifying trees in their neighbourhood, tree treasure hunt and making collages—to be displayed at NGMA. The first day will also see activities such as storytelling, street plays and tree walks at 13 locations around the city (including two special interest tree walks pertaining to art or lakes). In collaboration with Srishti Institute of Art, Design & Technology, there is a plan to use the new Cubbon Park metro station as an art rendezvous. The programme for Sunday includes workshops that are a “mixture of art and science"—including journaling nature, biomimicry workshop, plant illustrations, storytelling through dance, a music performance, talks and panel discussions, as well as specific introduction to the trees within NGMA campus (in the past, an audio guide was developed for use by visually handicapped children). Sunderkrishnen sums up best why trees deserve a special space in people’s minds. “They are so resilient—even if we chop them, they somehow find space to grow between two buildings or within cracks in walls. I also love the entire microcosm that surrounds every single tree—they certainly deserve more attention and love than we give them at present."